WARNING!! These things are a blast but I've gotten hurt using them. Watch out for rough ice and crusty snow patches. Be careful and wear all your safety gear. scroll down for more, click on any image to see a larger version in a new window. 1/16" thick flat spring steel. Mine came from a garage door mechanism. 3/16" to 1/16" thick will work. 3/4" pvc pipe and a strip of innertube for blade guards. I believe there is enough information here so an experienced hobbyist can make a pair that works well. If I'm wrong about that, please let me know. These skates are for kite-powered skating at high speeds on natural lake ice. They are unlike other skates because of their length, the shape of the blade and the stiff high boots. These are the skates I wished for while going 20-30mph over rough ice in my old figure skates. 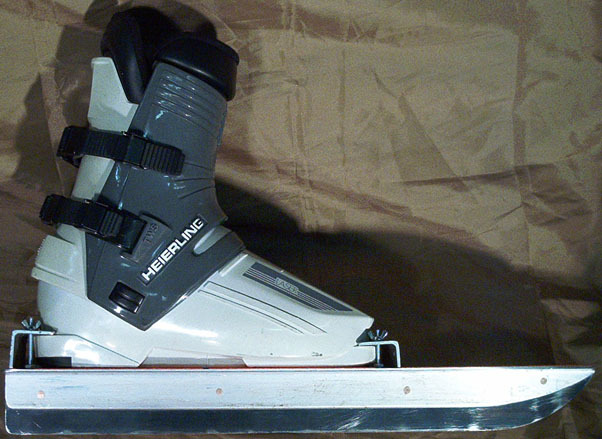 A friend calls these skates "hack me nots" or "machete harpoon shoes", because when I couldn't find the right steel for the blades I thought about using a pair of machetes with the edges ground flat. But then Garbage Santa filled my dumpster with spring steel from an overhead door recoil mechanism. Maybe the movie version will use machetes. The skates with the blade guards on. To make the blade guards, heat one end of the pvc tube with a hotair gun til it's rubbery. Form it into the curve you want. Dip it in cold water to cool and harden it. Cut a slot for the blade to fit into. Use a strip of innertube to tie the guard to the skate. Or use loops of elastic. I like to use innertube strips for everything. Side view of skate. The blades are 22" long, ~2.5" high from edge to sole. Other dimensions would be better for some conditions. Forinstance 4" tall could be good if there is some snow on the ice. There are four pieces of aluminum in the skate. Toe clip, heel clip, left and right sides of skate. 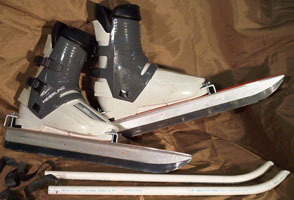 If your skiboots are DIN compliant the toe and heel will both have circular arcs. That makes the clips a simple shape. I cut mine from the same type of aluminum angle that sandwiches the blade. This sandwich is riveted together. Countersink the rivet holes slightly so the rivets can be filed flush. I used chunks of copper nails just under 1/8" dia. as rivets. Probably any thick copper wire would do. Put it on an "anvil" and beat on the protruding end with a light hammer. Very satisfying for the person doing it. Other people in the kitchen might enjoy it less. The edge of the blade is square and flat. Keep it cool when shaping it so you don't wreck the temper. I use a sponge to keep it wet when roughing it out, then a wet beltsander. Sharpening the blades is easy to do if you put both skates on a bench and file them at once. As shown in the book "The Boy Mechanic". The heads of the boot clip screws are countersunk. So they don't snag anything. 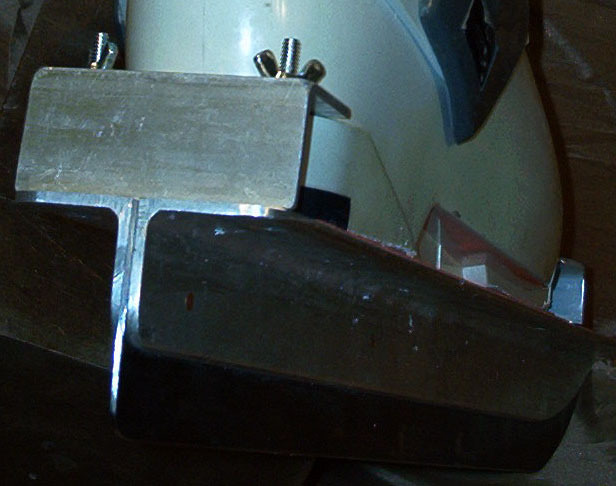 Cut off any bolt heads as close as possible. Remember that a protruding bolt killed Lilienthal. Round all the corners or it will snag on you and your gear. Look at the nordicskater site to see other styles of rough-ice skates. There's orange abrasive no-slip griptape on the front so a fearless well-armored passenger can stand there. 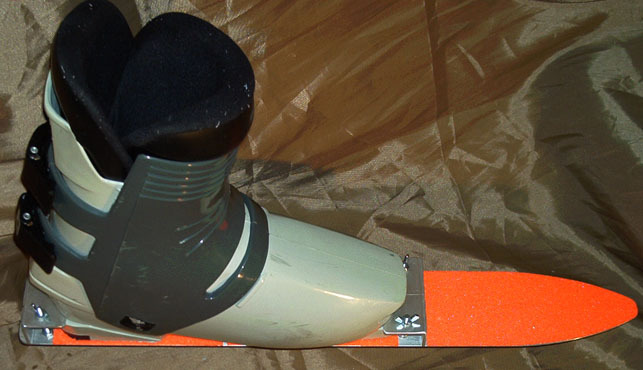 The abrasive tape under the boot keeps it in one place, takes some of the pressure off the clip bolts. Ice is hard. WEAR A HELMET. Dress as if for simultaneous hockey and windsurfing. 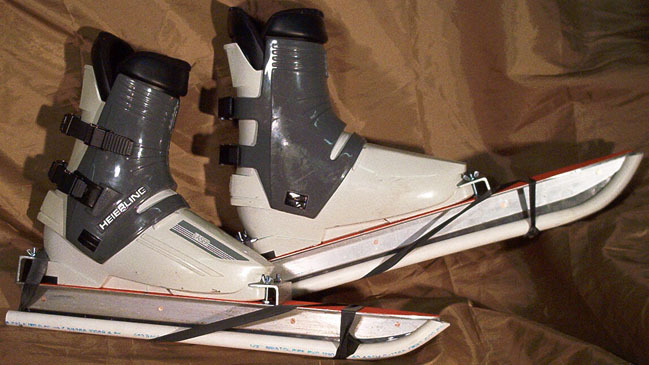 If you fall through the ice wearing a pair of these, you'll have trouble swimming. Big kites are dangerous in more ways than there is time to tell. blah blah blah.